Masahiro Tanaka, pitcher for the New York Yankees, is very good at throwing a very small cowhide ball into a very small area. In the three wins that Tanaka has played with the legendary baseball franchise, he’s been astonishingly good. The numbers are 25 strikeouts, 39 outs, 16 hits, and a lonely walk — that one came against the Chicago Cubs, who are no strangers to lonely walks. Andy Bergman — who is the man behind the must-see sports visualization website Dubly – has turned this information into a really awesome infographic (no big surprise there, that’s what he does.) When you’re done digging in that, we’ll talk about what Tanaka means to the Yankees and why they’re pretty lucky to have him. Finished? All right. Back in the frigid, frosty tundra of the Winter that Would Never End (also known as late January of 2014), the Yankees signed the Japanese pitcher to a seven-year, $155 million contract, giving him a full no-trade clause and a player opt-out in 2017. That’s on top of the $20 million they had to pay his Japanese team, the Rakuten Golden Eagles, in order for them to let him go, according to MLB.com. Three months ago, Keith Olbermann laid out a whole bunch of different paths for Tanaka’s career to go — citing the sad tale of Hideki Irabu and the mediocrity of Kei Igawa’s time in the MLB — but cautioned against the implied logical fallacy of assuming that Tanaka must also fail. Of course, Olbermann didn’t predict this, summing up his pessimistic take on the signing as “no matter which slice of history you look at, the problem is the availability of international stars, particularly international pitchers, is predicated on the fact that they are crapshoots.” The implication is clear — the money had probably been wasted, according to Olbermann. “I don’t know how guys even fouled the ball off sometimes,” Rasner told MLB.com. “It looks like it starts at their waist and hits the dirt in front of the plate. I don’t understand it.” You can see the splitter in action at the 1:00 mark in the video on the next page. That does look like a miserable pitch to try and hit. If we take Ted Williams at his word and agree that the hardest thing to do in the world of professional sports is to hit a baseball (it probably isn’t, but whatever), then we’ve got to assume that the spectre of Williams himself sent Tanaka to the Yankees to ensure that he will remain the last player to have a batting average over .400. 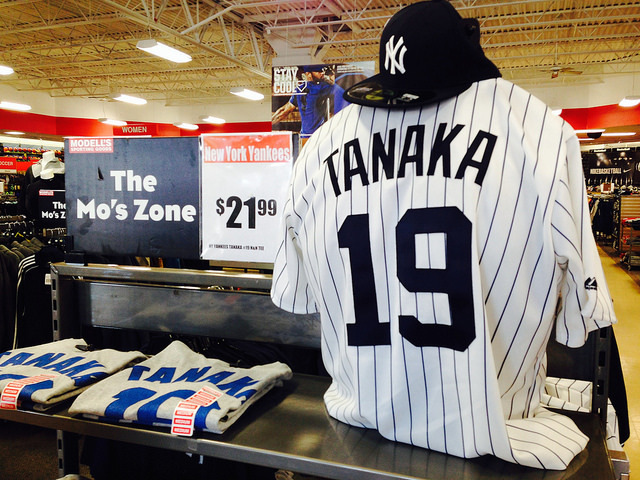 So far, the Yankees have spent well under $10 million dollars per out that Tanaka has directly contributed to. For a team that reportedly outbid the Cubs and the Diamondbacks, it seems to be paying serious dividends, regardless of what Keith Olbermann predicted.